IMPORTANT THAT ALL CUSTOMERS UNDERSTAND THAT THEY ARE IN CHARGE OF SCHEDULING A DUMPSTER RENTAL PICK UP BY FILLING OUT OUR DUMPSTER RENTAL PICK UP FORM. Customer accepts full responsibility for contents of dumpster and agrees to additional charges if it contains unacceptable materials. Contents are inspected by the landfill and recycling centers (see list below). The following items are unacceptable for pickup. Any of the above items discovered at the landfill will incur an additional charge equivalent to fines received. Customer is responsible for offloading excess debris if filled above level with top of dumpster. Customer is responsible for offloading prohibited items. A trip charge will apply if required to return. 10- yard dumpster 2 tons or 4,000 lbs/ 5 days of rental included in price. 12- yard dumpster 3 tons or 6,000 lbs/ 7 days of rental included in price. 20- yard dumpster 4 tons or 8,000 lbs/ 10 days of rental included in price. 30- yard dumpster 4 tons or 8,000 lbs/ 14 days of rental included in price. There is a $65.00 fee for each ton overweight limit. Trucks are weighed before and after entering the landfill. Exact weight tickets are available and can be provided upon request. Note: Loads cannot exceed 6 tons or 12,000 lbs. There is a $10 per day fee beyond the included days above. The only additional fees that could occur are charges for: overloading your dumpster, additional days beyond the included rental days, putting restricted items in dumpster, damaging dumpsters, or dry runs because dumpster is inaccessible. Thank you for choosing Hook-N-Haul Dumpsters. Austin’s choice for affordable and reliable dumpster rental. $75.00 minimum fee (depending on distance) may be charged to the customer. Dumpsters are not to be moved by customers. We can move the dumpsters upon request, however a $75.00 minimum trip fee may apply. Customer is responsible for any damages to dumpster (including theft) while on their site. Customer will accept full responsibility for any damage to their driveway, lawn, etc, which results from delivery and/or pick-up of dumpster. We respect your property and make efforts not to damage it. Credit Card Authorization: Due to the fact that we accept payment via credit card by phone before delivery of the container, you agree and give authorization to Hook-N-Haul to charge your credit card for any fees or charges that may apply to the terms and conditions above. Ordering a container from this web site constitutes a personal guarantee. By using or engaging in our services, you hereby acknowledge and agree to the terms and conditions above. 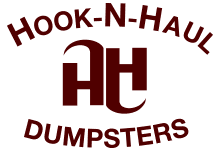 Hook-N-Haul takes all dumpster orders over the phone or by our website. We are unable to obtain a written service agreement. For all intents and purposes regarding financial and/or legal issues, the terms and conditions found here shall constitute a legally binding service agreement and shall have the same force and effect as a signed service agreement. The only additional fees that could occur are charges for: overloading your dumpster, putting restricted items in dumpster, damaging dumpsters, or dry runs because dumpster is inaccessible. Thank you for choosing Hook-N-Haul Dumpsters. Austin’s choice for affordable and reliable dumpster rental.